So today I’m going to get a whole lot sentimental (I should issue a free packet of tissues to all readers of this post) and some parts of my blog are going to be shouted very loudly from my roof top soap box. You have been warned! Although please don’t worry as I’m not an angry bird, (I’ll leave that to the highly addictive gaming app) my message is strong and comes from a very knowing and good place in my heart. Two years ago today I wasn’t laying on a leather Chesterfield sofa with luxurious tartan cushions to support and comfort my happy body. I didn’t have a multitude of coats for all weather types (yes Mama J knows that I’m a fully fledged fashionista) to keep my body snug and dry on my wonderful fun filled walks. I didn’t have toys galore to run around with and squeak as I pleased. I wasn’t given treats of the chicken, cheese or Pooch and Mutt variety every time I ran into the kitchen and stared at the cupboard and fridge doors where they are stored, thanks Marble for teaching me that trick before you passed. Not to mention I didn’t get to devour Granny’s lasagne every fortnight, yummy! Also I wasn’t given hugs, kisses and a loving lap to rest my head on. I was in an RSPCA rescue centre as my previous owner couldn’t take me with him when he had to move homes and my life was pretty miserable. I’d had my lady reproductive organs removed plus four bad teeth extracted. However before you reach for the gin bottle (I fancy a glass or five myself writing this downbeat start to this post) my story had the happiest outcome possible. Two years ago today I met my family and ten days after that I came from the mean streets of the city to my luxury country abode, where I get all the home comforts mentioned from my fabulous family. Yes, two years ago today Mama J having just lost her Harlequin Dutch lunatic of a rabbit, Cedric three days previous set about a search for a Yorkshire Terrier dog to live as a companion with the families handsome Cocker Spaniel, Marble. She wanted a Yorkshire Terrier (good girl Mama J, Yorkshire is always best) as her former next door neighbours had such a lovely Yorkie named Lucy when she was growing up, the memories of how lovely Lucy was had stuck with her for all these years. A massive thank you to Lucy for being so awesome, I owe you a great debt of gratitude for the life I have today. My breeds temperament was also marvellous for my families needs and lifestyle. After searching websites such as Pets4Homes and a mixture of rescue sites in the area for a few days, that fateful (for all concerned) Friday morning my image popped up on the local RSPCA website and Grandpa was set the task of ringing up for more information about me. My profile said I was loving, kind and got on well with other dogs. All very fine attributes in a dog. My family including Marble all drove there and then to the rescue centre to meet me. There was some concern as Marble hadn’t been neutered but at then almost 7 years old, it did seem a little unfair to put him through surgery when he was such a warm and gentle soul just to follow a recommendation. However the Manager of the centre after my Granny getting upset (she knew the loving life she and the rest of my family could offer me) allowed us a meeting and we got on famously well in the socialisation room. I was after a home visit, ten days and a lots of phone calls from my eager family to the centre later, on my way from the rescue centre to my new wonderful home. 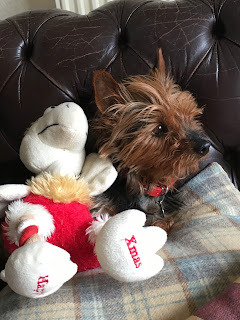 Two years on and I’m a Blogger with all the trappings of a social media lifestyle, thanks to Marble pawing over the reigns of his blog just before he died in February. So here I go on my soap box, this is my Eva (Evita) Peron moment, paw gestures and all, just to say if you can offer a dog/cat/rabbit/guinea pig/gerbil/parrot/snake/horse or any other type of animal I’ve forgotten to mention a loving home akin to the one I have today, then big PLEASE go down to your local rescue centre today and adopt. Mama J and I promise it will be the greatest move you’ll ever make. Alternatively if you are wanting a specific type of animal or breed, as I know certain animals and breeds suit different lifestyles better than others then please go to a reputable breeder. Okay that’s my preaching sermon over with for today. Thank you so much for reading this as it’s so important to me that all those beautiful animals, specifically the ones in rescue centres get a loving home as excellent as the one I have today. We are so happy you found a wonderful home. There are so many pets that don't and so many others who would even find the RSPCA the lap of luxury - doesn't bear thinking about does it.